Eminem, 44, has graduated from songs about his mother’s drug use into the world of political commentary. God help us all. In a video that was first shown at the Black Entertainment Television Hip Hop Awards, the white Marshall Mathers spoke about Breitbart’s Steve Bannon, football’s Colin Kaerpernick and any of his fans that voted for President Trump. …are coming into their heads at the time of filming. Somehow I don’t believe Eminem has spent enough time reading about Steve Bannon or his dynamic in the White House to be qualified to rip on him. The year is 2017 and famous rappers are dissing magazine editors. He’s also rapped about sexually assaulting Ann Coulter though, so maybe he’s a secret right-winger who’s been reading our favorite authors for years. His work with Dr. Dre was catchy and original, so it hurts to see Eminem go from fun lyrics to rapping about how he doesn’t like the guy who won the last election. Political commentary is for rock, punk and obnoxious folk music. Hip hop is about money and women. However, by 2015 Trump backed off and again praised the song as it reached 100 million views. 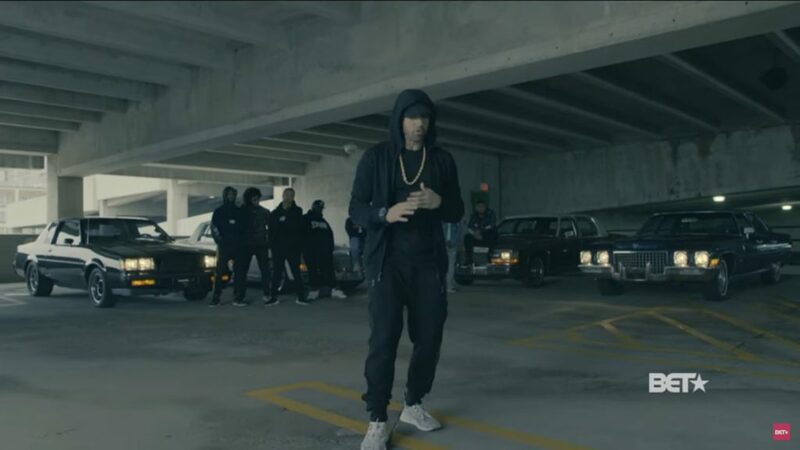 Here’s the video of Eminem “Ripping Donald Trump” in “Freestyle Cypher,” currently with over 4.4 million views and climbing.